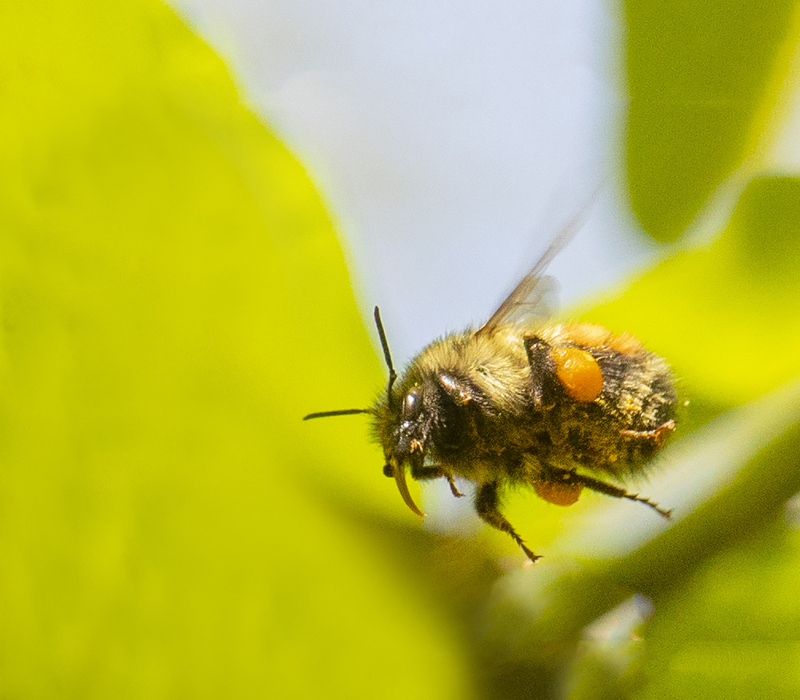 Scanning these photos on my desktop, the things I first noticed were the swollen orange-yellow balls on the rear legs of the bees: pollen baskets (corbiculae), I learned. And these ladies had surely maximized their storage space (no slackers here)! The corbicula, according to Wikipedia, is “a polished cavity surrounded by a fringe of hairs” which the bees use for storage of pollen. Not all bees have pollen baskets, but honey bees and bumblebees do. A 1771 encyclopedia, says Wikipedia, described the structure but gave it no name. In 1802 the name corbicula was introduced into English. 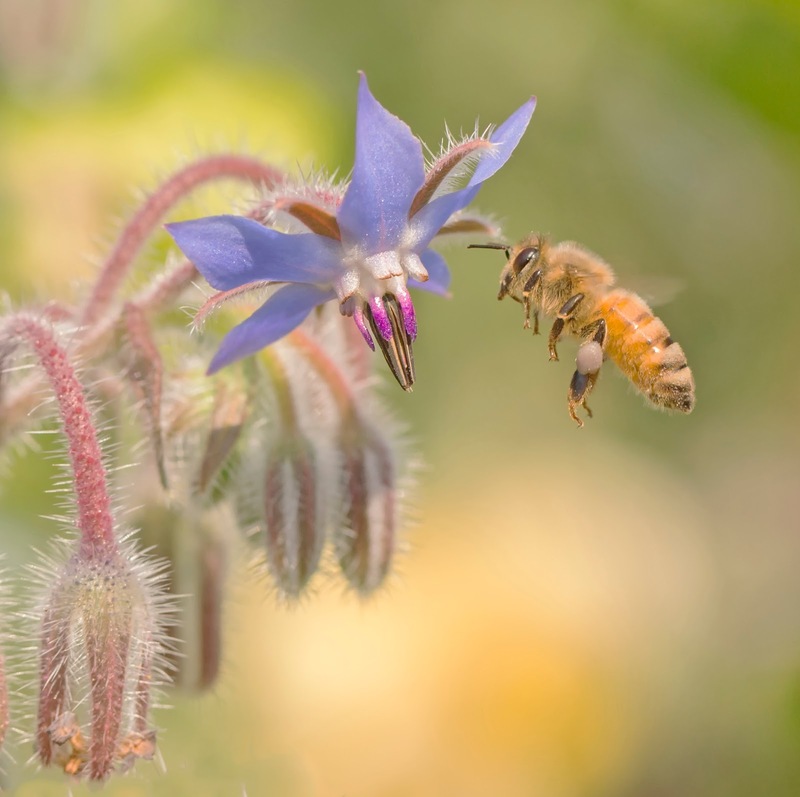 Bees, of course, do not pollinate flowers out of the goodness of their tiny hearts — pollination is incidental to the bees’ collection of pollen as food for the hive. 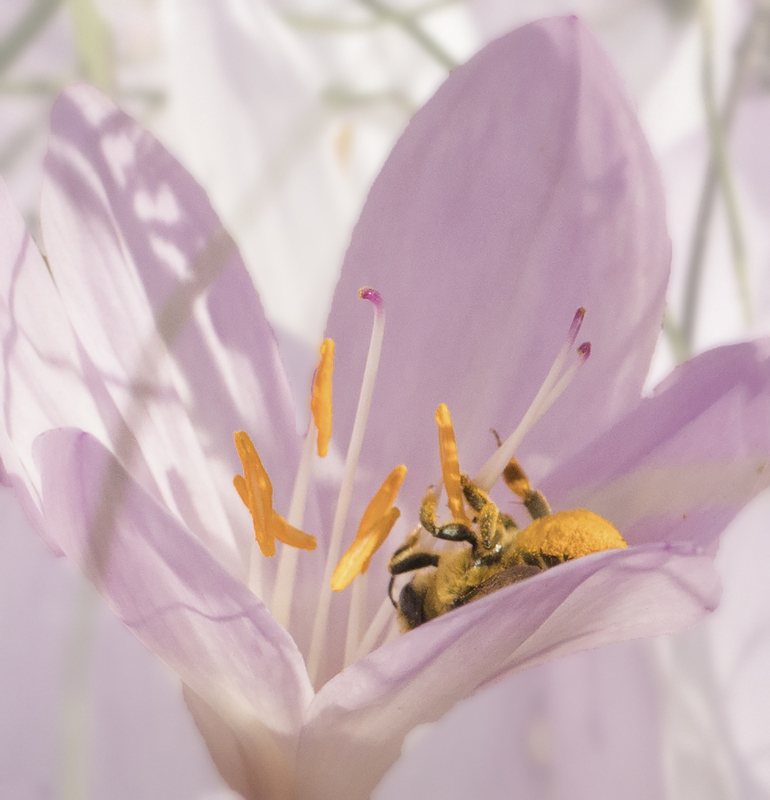 When a bee crawls around in flowers (see the photo here of a bee wrapped around a stamen) and rubs pollen off anthers, the pollen adheres to the bee’s hair and body. The bee then licks and moistens her forelegs, then pushing the pollen into the baskets in a grooming manner. The bee then transports her load to the hive. 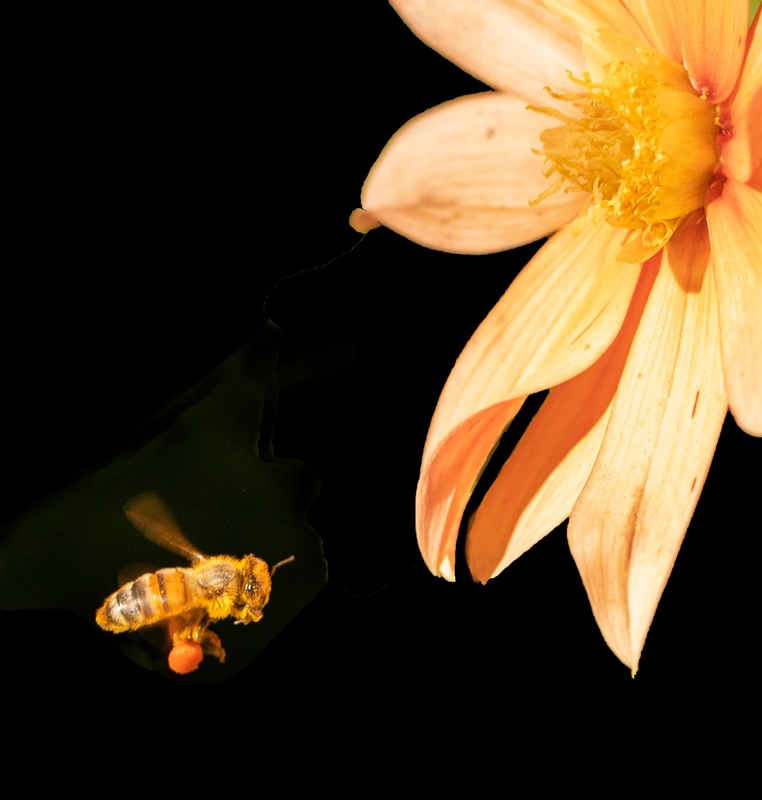 Now for the pollination part: What doesn’t make its way into the corbicula is likely to pollinate the stigma of another flower of identical species. 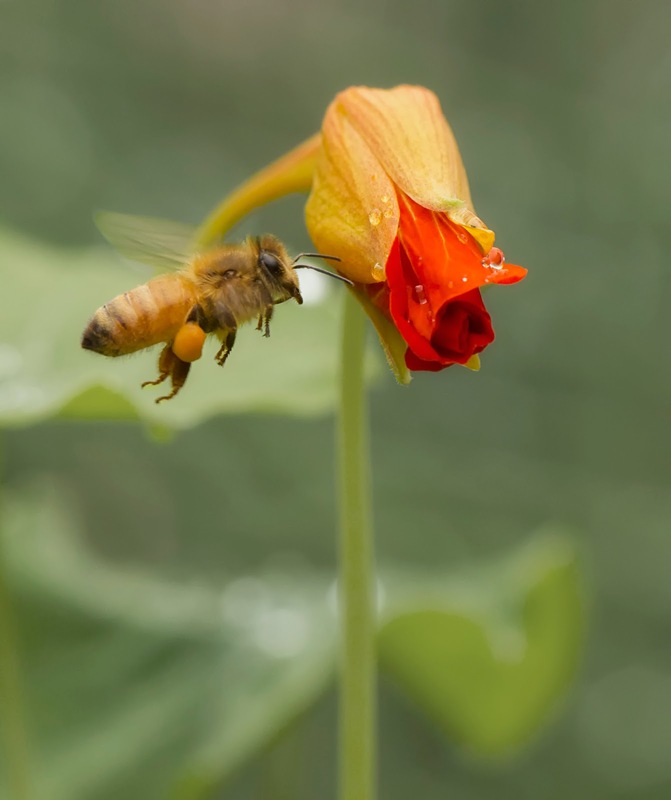 Indeed, according to Wilson-Rich’s excellent book on bees (see below), they tend to gather the pollen from one kind of flower at a time — which has certainly seemed to be the situation when I watch the bees. They appear to work most of the flowers of one species before moving on to a different kind of blossom. And here’s an example of a beige pollen basket… not a color I often see. I’ve seen yellow pollen baskets, orange, and even beige (yellow/orange and beige are pictured here). Wikipedia says the color of the pollen indicates the source, which makes sense. Beautiful series of photos. And, thanks for education us about the corbiculae! Gloria, thank you so much for your amazing close-up photographs and your entertaining and informative narrative! This was a real treat.